Now we like our coffee and, as you may have sussed, we like our bikes. Any combination of pedals and java is a match made in heaven. One of our readers brought The Trade Cycle to our attention. This rolling café was conceived and developed by Paul Sabin and his wife Emma, in concerto with Simon Rickard. The whole set up was designed with three points in mind: efficiency, quality and style. We recently posted about a Danish coffee bike - one that is much more mobile - but this British trade cycle is really impressive. It has everything you need to sell coffee and edibles to the masses. 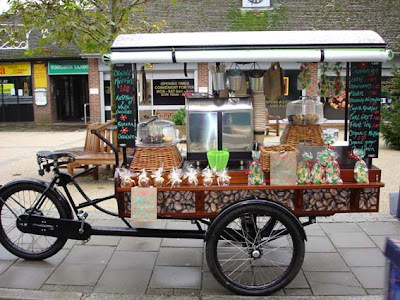 On their website they recommend riding it for a few kilometres from base to selling point and hills are not encouraged, but a coffee bike like this could easily be seen on the streets or squares of a hundred cities around the world. A splendid initiative. We wish them best of luck with the Trade Cycle.